The Greater St. Louis Jazz Festival this week announced its dates for 2019, with public concerts set for 8:00 p.m. on Friday, April 12 and Saturday, April 13 at the Touhill Performing Arts Center. Friday's concert will feature the DIVA Jazz Orchestra, the all-woman big band led by drummer Sherrie Maricle. 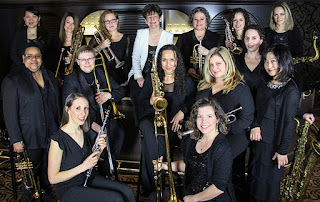 Based in NYC, DIVA (pictured) celebrated 25 years as a band earlier this year with the album 25th Anniversary Project. Saturday's show will feature the "Ultimate Jazz All-Stars Big Band," an ad hoc assembly directed by drummer Gregg Field, and will serve as a tribute to bassist and UMSL director of jazz studies Jim Widner, who founded the GSLJF and is retiring from teaching next year. Although a complete lineup of musicians isn't available yet, players mentioned in the promotional email as participants on Saturday include saxophonists Tom Scott and Eric Marienthal, multi-instrumentalist and bandleader Gordon Goodwin, bassist Carlitos del Puerto, pianist Shelly Berg, and drummer Scotty Barnhart. Tickets for the Greater St. Louis Jazz Festival are $35 per night, $33 for seniors, $15 for students, and are on sale now via the Touhill box office.